Recently we stopped in a Barnes and Nobles to do some reading. Am I Ready to Date Normal After 3 Years? For the past 3 years or so I've been having a back and forth about dating with this guy. We started the process but a uncomfortable phone call killed any hopes of meeting in real life. He said I was old since I was over 25. Urgh! But once in a while now we trade 1 or 2 emails before continuing with our lives. Things just didn't click for either of us. Besides I never forgive him for the old comment. Fast forward and a chance spam email bring us back to step one. This time he feels we should give it a real shot. His argument? We should at least meet in real life and see. After all we didn't give it a chance. After seeking advice from my community, who I really shouldn't ask for dating advice regarding asian men, cause they're bias!, I decide why not, nothing to lose. So we plan for a lunch date. Well, that lunch date changed into a dinner date. I wasn't happy when he mentioned meeting me in the evening. I'd have my son with me and meeting like that was NOT the plan. But I figure it would only be for a few minutes and then we can move on with our lives. You'd think I'd learn by now that nothing is ever as simple as I think. We meet and walk around a bit and then agree to have dinner. He headed over to Harlem BBQ which is nice and empty with high chairs. The date itself is fine. He's nice and engaging. He not weird around my son. It's like we've been hanging out for years. No issues there...at least not for him. But there's some issues popping up for me. First issue is his Asianess. He's an adopted Korean like my son's father. But unlike my son's father it's not an issue for him. He's made peace with it. But the similarity AND the difference to my son's father is bugging me. Second issue is his interest in me. It's not creepy or anything. It's just normal attraction. He tells me I'm attractive, he's enjoying my company, etc, etc. But after being shut down for 2 years it's not so easy for me to hear and process that type of interest. And that whole conversation about how he hates dating and would rather just meet someone and be serious....I nearly fainted. Third issue is his interest in my son. Someone bonding with my son is a big issue and one I wanted to avoid for as long as possible. I dont want to hurt someone if things don't work out with us. It goes without saying that I don't want my son hurt either. So far my son's only concern is can he get more corn bread! As we pose for the photo, the waitress says "But the baby isn't in the photo". I said it's fine and told her to take the photo. I thought to myself, "lady I did it that way on purpose, this guy isn't my baby daddy". Which is something else. No matter where we went from the train ride, to walking down the street, to sitting in the restaurant....no one acted weird, no bad comments, no weird looks, nothing. Did I mention we are in Harlem sitting in a black restaurant? If anything everyone gushed at my son and how cute he is. 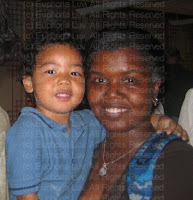 Everyone acted like it was normal for an asian guy to walk around with a black women and blasian child. In a way it is normal. But the question is will it become the norm for this asian guy and this black girl with her blasian baby. Today we headed over to the Fall Kids Fest in Madison Square Park. I was there to cover the Winktuk booth for a blog post but after that we could freely run around and enjoy. We arrived early before my event was ready so we walked around to see what vendors and activities were there. I also tried to make a quick stop at the playground but it was packed. What the heck?! It was 10am in the morning. Anyway, after a quick walk around we headed back to the Wintuk tent to meet the performers and take our photo. Daniel was a bit nervous of the people in costumes but after a few tries we got our photo. Then we went to the Scholastic table where Daniel made his very own book. Ok, ok he did get some help from me and the Scholastic table person but all the coloring he did all by himself. From there we tried going to the other tables, face painting and get some cotton candy but it started to get really crowded. Not to mention Daniel started getting just a bit cranky. I didn't get a photo of the full area but it was huge. They were pumpkins of all sizes for kids to pick and choose from. There was also a table with arts and crafts you could make for Halloween. I tried making a mummy man using gauge and Popsicle sticks but Daniel started the melt down again. As we left the park, I was sad we didn't take our pumpkin. In the end maybe it was for the best. That pumpkin would have ended up being a ball for Daniel or pumpkin and chicken dinner for me. Love live our pumpkin!